AgustaWestland is offering an increased-gross-weight version of its AW609 civil tiltrotor that trades off some vertical takeoff capability for a higher payload limit. AgustaWestland (Pavilion OE1) is offering an increased-gross-weight version of its AW609 tiltrotor, which trades off some vertical takeoff capability for a higher payload limit. This will make it more attractive for some missions where vertical capabilities are not needed on departure. Type certification of the AW609, for which the Anglo-Italian airframer claims to have around 60 orders, is planned for 2016. The protracted program (the aircraft first flew in 2003) is now entirely in AgustaWestland’s hands, since the company effectively took over Bell’s share late last year. As Richard Luck, head of AW609 marketing, explained in a briefing here at the show yesterday maximum takeoff weight can be 16,800 pounds or 18,000 pounds. The latter could allow an offshore operator to take off from its land base using around 800 feet (takeoff distance to 35 feet). All nine passenger seats would be occupied and the rotorcraft would still embark with enough fuel to fly 350 nm. At the offshore oil platform, the aircraft would land and take off vertically, as weight would have reduced enough to do this. In cruise, speed would be 250 knots (these numbers assume ISA conditions, with a 30-minute fuel reserve). The certification process is complex, according to Luck. “We have a certification basis agreed with the [U.S.] FAA,” he said. The AW609 will be certified under both Part 25 [fixed-wing aircraft] and Part 29 [helicopter] rules. In addition, the transition phase, which lasts a mere 40 seconds, calls for “a new element” of certification. EASA is shadowing the FAA’s certification effort with a view to eventual certification of the first civil tiltrotor in Europe. The two aircraft in the flight-test program have logged a combined 700 hours. This translates to 85 percent of the flight envelope. Next in the program is autorotation testing. 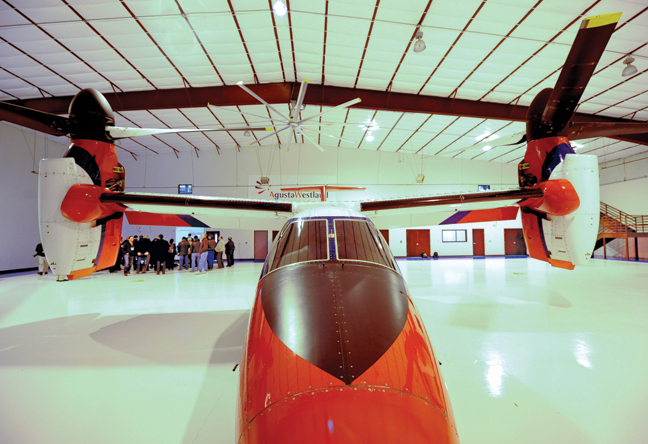 One aircraft is based in Cascina Costa, Italy, and the other in Arlington, Texas. AgustaWestland officially became the sole owner of the program on Nov. 15, 2011, and the type certification application was transferred on Feb. 15, 2012. It is now the “design authority” for the AW609. Transfer of intellectual property rights from Bell is also complete and the certification has resumed.